Many forms on this website are fillable, meaning that you can type data directly into the form using your PC via your PDF reader. This will be either by entering data into fillable fields, or by using the Typewriter Tool. If you are using the latest version of Adobe Acrobat Reader, you will also be able to add photo and signature images to the form if the form allows (this feature is currently limited to the Class 1 & 2 Application Form and the Visa Application Form) . You will also be able to save your input. Some other PDF readers will not let you save the data you have input into the form. You can get around this by printing the form as a new PDF file if you have software installed which can do this, such as Primo PDF. Another solution can be found here. If you have problems opening PDF files including legislation and forms on this website, we have some suggested solutions below. The majority of problems are caused by incompatible browsers, browser settings, or browser plug-in settings. There is a well-known problem with the Firefox browser in particular. This is not peculiar to this website. 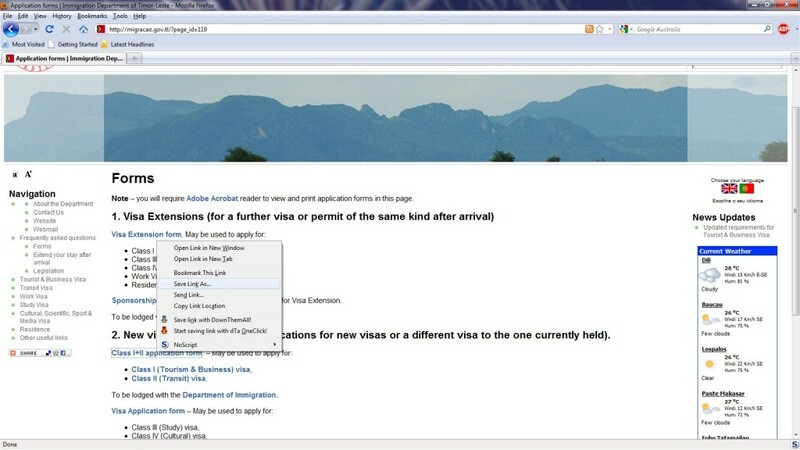 Users of Google Chrome may also experience problems where there is no PDF viewer plug-in installed. Browsers included with portable devices such as mobile phones may also experience problems. Make sure you have the latest version of your PDF reader installed. The latest version of Adobe Acrobat reader is available here. The simplest solution within most browsers is to right click the file hotlink, and choose Save Link As, and then choose where to save the file. You will then be able to open the saved file with your PDF file viewer (such as Adobe Acrobat Reader). See screen-shot below (example from Firefox). By default, Firefox tries to open. pdf files within the browser, which is where the problem may arise. Changing these settings so that Adobe Acrobat Reader opens the file separately will permanently solve the problem. This applies to other (alternative) pdf readers you may have installed as well. To change the settings, open Firefox, go to Tools, then Options, then Applications as per the screen-shot below. 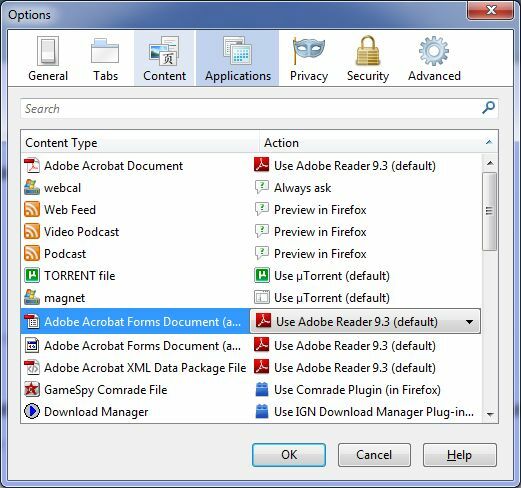 All entries for Adobe Acrobat documents need to be changed in the right-hand Action column to Use Adobe Acrobat Reader X.X (default) rather than open in Firefox (which is the standard default). If all else fails,contact us and we can email the form you seek.